"Nothing Changes Until Somebody Feels Something"
I've always been amused by the term "free range chicken." Why? Perhaps because "free range" is more commonly associated with cattle. Perhaps it's the imagery it evokes — chickens running around outside, doing as they please, with few restrictions on their wanderings. Regardless, I always smile when I think about "free range chicken." Recently, a variation on the "free range chicken" theme came to mind — "free range staff." Why? Perhaps I'd thought about "Dilbert." Perhaps, when driving by a call center, I'd thought, "I'd just HATE working there!" Regardless, I couldn't get the image of densely packed staff out of my mind, and then I equated "staff in cubes" with "chickens in coops" and, voila — "free range staff"! The more I thought about it, though, the more I liked the concept behind "free range staff." After all, it's entirely consistent with the qualities I look for in both consulting staff and "behind the scenes" staff — people who can take an idea, develop and run with it, and then come back to me when the work is done or when they are stuck. The president of a client who is currently searching for a new staff member is looking for the same qualities — "I believe in hiring good people with strong accountability, and then turning them loose." What does "free range staff" have to do with book reviews? That's where another association came to mind — how we use books in my firm to explicitly teach and develop key qualities, and to reinforce a culture of high expectations. Over the years, I have identified a number of books, largely in "business fable" format, which are easy to read, yet teach valuable lessons for the workplace. In discussing a book with my coach, I might propose making it required reading for the staff. If she concurs, then we'll determine the key lessons we'd like staff to take away — and, to ensure folks take the reading seriously, she develops a quiz on the book. Making reading assignments speaks to the high expectations I set for staff — and requiring a quiz drives home the importance I attach to learning and living out the book's content. • Leadership and the One Minute Manager — Developmental Levels and Leadership Styles — and matching them accordingly! • Formula 2+2 — Providing Feedback — and delivering it appropriately! • Who Will Do What By When — Making Clear Promises — and honoring ALL of them! • The Question Behind the Question — Practicing Personal Accountability — and asking better questions to get better answers! • The Three Essential Coaching Habits for the Time-Crunched Manager — Creating the Learning Moment — by avoiding being too helpful, and slowing down the "advice monster"! The books that follow form our syllabus for expected behaviors in the workplace — behaviors that allow my folks to function as "free range staff." • The developmental levels they'll go through when progressing from "new staff" to "free range staff." • The styles I'll use to appropriately help them at each stage of their growth. • Competence — A function of knowledge and skills that can be gained from education, training, and/or experience. • Commitment — A combination of confidence and motivation. Keep in mind "competence" and "commitment" are specific not only to a person — they are specific to the task the person is doing. Thus, the same person can simultaneously have different levels of "competence" and "commitment" — and this is important to keep in mind, as the person develops and new tasks are assigned. • Directive Behaviors — These involve the leader clearly telling people what to do, how to do it, when to do it, and then closely monitoring their performance. As you likely surmised, Directive Behaviors develop Competence, and Supportive Behaviors develop Commitment. Based on Leadership and the One Minute Manager, page 85, and Helping People Win at Work, pages 103 and 106. Situational Leadership is Not Something You Do To People. It's Something You Do With People. This short book, told in "business fable" style, has been invaluable in helping me quickly onboard new staff, and helping them understand WHY I changed how I was working with them as they developed, moving from me telling them the answer, to me asking them questions to help them uncover the answer. I talk with my staff routinely — and especially so with my new staff. Most of the discussions I have are how things are going with their work, what help may I give them, what process or technology improvements would help their productivity, and how the two of us can work better together. During our conversations, I try to give appropriate feedback on their work — both compliments and suggestions for improvement. A book I also go over with new staff is Formula 2+2 — by covering the topics with them, they will know what to expect from me, and I'll refresh my knowledge of how to effectively give feedback. Speed is a requirement for organizational success. Thus, one goal of the book is to help managers find ways to "provide constant feedback and coaching." To me, this is especially true for new staff — the sooner I can get them oriented and productive, the quicker I can focus on my other tasks. • "The brain doesn't function well under threat" — yet, much "feedback is delivered in the form of criticism." • "The brain responds much more predictably to encouragement." • So much of what we, as managers, do "is expedient, violating trust — when trust is the basis for the rapid positive shaping of behavior." • Correcting behavior is only half of the manager's job. The other half? Recognizing and reinforcing what is going right. freedom to try and fail, then try again and succeed." As the chapter's title implies, the essence of 2+2 is this — place equal emphasis on what employees are doing well, and what they might need to do to improve. • Balance — Provide an equal number of compliments and suggestions for improvement. • Timely — Provide feedback in a timely fashion — the sooner after the behavior, the better. • Focus — Provide feedback on the highest priority areas, limiting these to the two most important compliments and two most important suggestions for improvement. • Specific — Support feedback provided with specific examples. Saying "good job" is not effective feedback because it is not specific. • Follow-Up — Reinforce feedback with appropriate follow-up, which can be formal (a scheduled meeting) or informal (dropping by the person's desk). Finally, remember to deliver ALL feedback in the spirit of 2+2 — the desire to be helpful and encouraging, out of sincere concern for helping people develop, and celebrating success when people perform well! While I liked the concepts in this book, most of the book focuses more on concepts and rationale and less on detailed examples or implementation specifics. Thus, there is a lot of substance in a small number of key points. and honoring ALL of them! "Free range staff" will make clear promises and honor them. Pretty simple, eh? Yes, and no. • Yes, the concept is simple. • No, the process to make and honor clear promises has several nuances. The book teaches its lessons using a "business fable." Formerly a successful salesman, Jake McKay is now a failing manager. Down on his luck in work and in love, Jake reconnects with his old Little League baseball coach to learn the fundamentals of team and personal effectiveness. Coach helps Jake see how he is letting down his staff, his girlfriend, and himself by not keeping his promises — and how this diminishes him in their eyes. • Yes — "I will do X by Y." This becomes a Promise. • No — "I will not do X by Y." • Counter Offer — "How about if I do Z instead of Y?" • Commit to Respond Later — "I can't answer confidently at this time — however, I will respond by X (time)." Notice that ONLY the "Yes" response — and also the "Counter Offer" response, if it is accepted — result in a Promise. 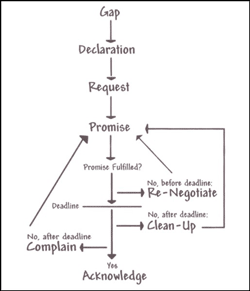 Without a Promise, the person making the Request has no right to expect the Request will be done. • Promise Fulfilled — The person making the request needs to acknowledge the Promise has been fulfilled and thank the person for doing so. resulting in a new Promise. fulfilled, as well as how any problems coming from the missed deadline will be addressed. complain to the other person and take steps to complete the task and resolve any issues, and restore integrity to the relationship. Like the other books, the WWDWBW concepts are deceptively simple, yet sometimes hard to master. For me, the "By When" is the toughest — I frequently forget it when working with my staff because I want things NOW! Of course, this is not possible, so my staff will correctly ask me, "Okay, Todd — I'm clear on WHAT you want — WHEN do you want this?" That question causes me to think about when I really NEED the task completed, as opposed to when I WANT it done. After that, we can negotiate the "By When," which then results in a Promise. This book even helps people get the "little things" right — like being on time for a meeting. Everyone knows that traffic can be unpredictable, so it's okay to be late to the meeting, as long as you notify the chair PRIOR to the start of the meeting of the delay and your estimated time of arrival. and asking better questions to get better answers! What actions can I take NOW to best move things forward? Asking better questions leads to better answers. Don't let the simplicity of this statement fool you — you need to understand WHAT makes one question better than another before you can achieve those better answers. The author talks about Incorrect Questions — IQs, for short. When we encounter a situation, our first response is frequently negative or defensive, causing us to ask an IQ. What's bad about an IQ? • They are negative — they don't solve any problems. • Nothing positive or productive comes from asking them. • They are the complete opposite of personal accountability. • Begin with "What" or "How" — NOT "Why," "When," or "Who"
• Contain an "I" — NOT "they," "we," or "you"
• Focus on action — Use words like "do," "make," "achieve," and "build"
Why are certain words prohibited? Because including those words would result in an IQ. • "Why," "When," and "Who" promotes a "poor me" attitude, encourages putting off action until another time, or looks for a scapegoat, respectively. • "They," "Them," "We," and "You" all fail to focus on the ONE thing you CAN control — yourself! This book is a series of short lessons, illustrated with vignettes from the author's experience, on various aspects of QBQ. by avoiding being too helpful and slowing down the "advice monster"! The Three Essential Coaching Habits for the Time-Crunched Manager , by Michael Bungay Stanier. I came across a good resource while renewing my subscription to a daily email I occasionally read, and got a "freebie" — a wonderful 33-page PDF for renewing! In The Three Essential Coaching Habits for the Time-Crunched Manager, Michael distills a LOT of what the preceding four books describe, and provides practical tips to make things actionable. While this is not a book, its content fit so well with the four books, it seemed a shame not to include it! To develop your staff quickly — to move from "New Staff" ("Enthusiastic Learner") to "Free Range Staff" ("Self-Reliant Achiever") — consider using the tools in these books to set expectations, and deliver results! "Seeing Around Corners - And Four Books That Can Help"